Fresh off the back of a nasty chest infection, we've had the best couple of weeks with Peyton. I'm starting to feel really Christmassy now and I'm so much more excited than normal. I love Christmas anyway, but this year feels even more magical and special. She's been so happy, so smiley and so cheeky. She really seems like she's starting to understand things now - and her facial expressions are just brilliant. We're hitting so many 'milestones'. When she wants something that's not nearby she now just rolls to get it, and rolls from one room into another. She's almost sitting up by herself - she can hold it for so long before flopping to the side. And her eating is coming on every day! She is absolutely loving her fruit and veggies, she honestly can't get it down her quick enough most nights. We've started introducing a little bit of finger food, too. 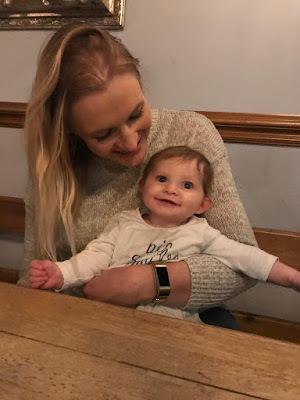 After my last post about weaning someone commented - unsure if it was being helpful or snide; I'll hope the first - to say that the way I was planning on weaning Peyton could not be classed as baby-led weaning when she hits six months because I'd done purees before. Apparently the way I am doing it is 'traditional weaning'. Tags aside, it's working for us so far. I've given Peyton some of the Kiddilicious wafers. They basically look like prawn cracker texture/consistency that are shaped like tiny surf boards. They melt in the mouth so Peyton doesn't need to chew them, as such, so there's less risk of choking. I thought these would be good practice for her to get used to putting stuff in her mouth/biting etc. She's loved them so far and is really, really good at her hand-eye coordination. We've also tried her with some Ella's Kitchen melty sticks. These are kind of like big Wotsits. When I say 'big', they're not like a bread stick size. Again, these melt in the mouth and are great for hand-eye coordination and getting her used to finger foods. She's really starting to get the hang of it now - she bites down, chews, moves the food around her mouth etc. It makes me more excited for when she turns six months and I can just get her onto everything we are eating - within reason, obviously. Flavours wise, she absolutely loves broccoli. I mentioned that last time, I think. We've since added in peas, and she's been a fan of that. We've tried avocado which went down brilliantly! We then did broccoli, peas and green pepper which she practically inhaled. We've started adding in some fruit now, too. She's had banana on its own, banana and apple, then banana, apple and pear. I've also added some pear to avocado for a sort of 'pudding' after her veggie 'main course'. Greens seem to be a hit so I may go back to carrot/sweet potato etc. and try some new variations with those. So far, though, there's not been anything that she's not liked, which is good. And nothing that she's struggled with, either. I try make sure everything is a slightly different consistency, so she doesn't just get used to swallowing straight away and learns to move it around her mouth etc. Honestly, I have no idea what I am doing - or if what I am doing is 'right' - but Peyton is loving life and is happy so I will continue. We don't really have much of a strict, set routine as such. Predominantly because we are out and about practically every single day, so it's hard to be stringent. Peyton basically runs the show, too, and everything is on her terms. But, I try most days to always give her her tea. I offer milk usually around 4pm - depending where we are/if she's asleep. If not at 4pm, then as close as possible. Around an hour later she has her tea - usually one pot of veg followed by something fruity. Some days she will eat both pots entirely, other days she'll only have half. I never force her to eat, as she gets all her nutrition from me at the moment. It's all about textures and tastes, so I don't work myself up about how much she's had. Some days we'll do breakfast, but that very much depends on our itinerary for the day ahead. If we do breakfast, though, she has baby porridge (when she's six months and can have gluten I am just going to give her the same porridge as we have, but with the oats ground up more) with some fruit puree mixed in, or just fruit puree on its own. We haven't started with dinner yet, purely because we're usually out and about. It's also a messy time - I tend to strip her off to just a nappy for meal times as it's easier and less of a worry about clothes getting covered in food. I can't be bothered to do that three times a day just yet - and to deal with the clean-up operation after! I'm very much ready for being able to give her solid solids at six months. She tries to eat everything she gets her hands on. Her favourite thing at the moment is paper. At her christening she ate three order of services. When we've been out she's eaten menus and, last week, she ate the corner of an envelope. Tom said to me the following morning her poo had bits in. It was only later that day I realised it was probably paper! It's wonderful watching her grow and change everyday. Tom and I sit most nights looking back at pictures and videos from when she was a newborn and it's crazy how much she has changed. Even looking back at photos and videos from just a month ago. It really is true, they grow up so fast! I'm so unbelievably excited for her first Christmas! She won't have a clue what's going on, next year will be so much better for her, but the memories we can all make to share with her when she's older will be priceless. I remember when I was little I used to love watching home videos from my first Christmas/birthday/other occasions. There was one video, from when I was a toddler as my brother was born, and dad was videoing me opening the presents from my stocking. I was so excited about every single one, it was so cute. But, what excited me the most, was the fruit in the bottom. Every year, Father Christmas used to leave me a satsuma/clementine in the bottom. I don't know why, but I loved it. I can't wait to have traditions like that with Peyton.